I remember the first time I became aware of the shortest verse in the Bible. I was young, maybe 12 or so, and I was visiting my grandmother. We were playing a trivia game (although I believe at that time we just called them questions) and my question was to give the shortest verse in the Bible. I didn’t know the answer. But once I heard it, I’ve never forgotten. As a romance writer, I need to envision a strong hero. Someone who has character strength, emotional strength, and spiritual strength. I want my readers to fall in love with my hero and become emotionally attached to him. So I have to give him the morals of Jesus yet the frailties of a man. That’s hard to write. Growing up in the 60’s and 70’s, my parents kept telling my brothers that boys and men don’t cry. They had to hide their emotions inside and present a stoic face to the world. That only sissies and babies cry. The Man who had God’s knowledge of the future was so saddened by His friend’s death, He let His emotions spill out in the form of tears and wept. Jesus was of the house of David. In 1 Samuel 16 we read of how God sent Samuel to anoint David—the shepherd boy—to be the next king. David wasn’t perfect and made some really huge mistakes in his life but God chose him because he was a man of God’s own heart. (1 Sam 13:14, Acts 13:22) And yet David was one of the most emotional men in the Bible: 1 and 2 Samuel record at least 4 instances where David is weeping (1 Sam 30:4, 2 Sam 15:30, 2 Sam 18:33, 2 Sam 19:1). And we’re not even talking about his laughing and dancing in the streets here, just his weeping. A man after God’s own heart. Think about that. And what about Solomon—the wisest and richest king who ever lived. He wrote in Ecclesiastes 3:4 A time to weep and a time to laugh, a time to mourn and a time to dance. (NIV) Solomon doesn’t add … but only if you’re a woman or child. And that’s not even halfway through the Bible. These are all strong biblical heroes we want our sons to emulate. And they all wept in public. And the people mourned with them. Why is it, when we see a grown man cry, we look away as if ashamed? We might walk up and give solace to a woman—maybe a hug or an arm rub—but when tears are shown on a male, we ignore him until he’s ‘got his act together’. Now I’m not saying to walk up to some strange guy and start hugging him because that would put a whole different connotation on the picture, wouldn’t it? But if you know the man, just sit near him and be still. Your presence and silence will show true compassion. If he doesn’t want it, he’ll leave. Weeping isn’t a form of weakness. It’s simply an outpouring of emotion. Oh, what a heart-grabbing post. I've often pondered that shortest verse. Was Jesus sorrowful FOR his friends? Humanly caught for an instant by the reality of DEATH WITHOUT the cross? Thinking what His human body and supernatural soul, heart, and mind must soon endure, facing sin head-on??? Very interesting subject, Anita. 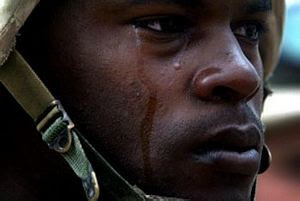 I've certainly seen my father cry, my brother, and my sons, but it makes me stop and think if I've seen my husband cry. It's a good reminder to be supportive, even if he doesn't actually shed the tears. I'm actually not a big crier. I'm more likely to cry because I'm happy or touched or frustrated than because I'm sad. I wish I would cry more, because I feel so much better afterwards. I love your thoughts about, "Jesus wept." I rarely used to cry, because my family didn't seem to accept tears. I married a man who allowed me to cry and who cries with me at the movies! You can only imagine how many tears we've cried over the crisis in our lives. Thanks Anita for reminding us of the shortest verse in the Bible. Thank you so much for your post, Anita. I needed to read it this morning. How blessed we are that Jesus understands our pain, weariness, fears, frustrations and tears. Hey Patti - I'm not a deep spiritual thinker and He probably was feeling the things you mentioned. But I like take it down to the simplest level and believe at that moment, He allowed His human vulnerability to override His 'mission' which must have been a constant pressure. Hey Anita, this is awesome! Can I read it at youth some time? It would be great for all those boys to hear. For about 10 yrs after, Hubby stayed dry-eyed until he finally accepted Christ. Now it's not unusual for him to tear up during a moving service or song. Or movie. Or inspirational romance. I think having Christ in his heart released him from wordly perceptions and allowed him to be more Christ-like. Dina - sometimes the first tear is the hardest and then it's a flood. Perchance you just need an onion or two to get started? Jill - you of all people know that bottling up your emotions just creates a volcano later. It's too bad Randy still remembers it - obviously it left an impression on him - because the guy who said it is the equivalent of an emotional bully IMHO. I cry at strange, often inappropriate times. Seeing my husband, father, former pastor, or big teenage boys cry will set me off in an instant. Why have we taught our men that the only emotion they are allowed to experience and express without losing their machismo is anger? I've often wondered if Jesus was weeping for all the mourners gathered there. If he was moved with compassion for them as much as his own humanity. Hey Susie, I'm glad to hear you say that because it wasn't the post I was going to write. And when it was done, I almost erased it. But sometimes we have to shut down our thoughts and go with our hearts. Thanks again for telling me. Uh Niki, that's empathy you're showing them. And yes, I'm sure you're right. Jesus would have felt their pain of loss while they awaited Him. There's also the passage in Luke 7:11-15 where Jesus is standing there when the funeral procession walks by with the grieving widow and her dead son. Jesus feels so much compassion for the widow he gave him back to his mother. Thank you for sharing, Niki. Wow, Anita. This is beautiful. I know a few men who could benefit from reading this. Actually, I think everyone who reads this, men and women, will benefit. But I do know people who, like you menioned, consider it weakness to show emotion. The disservice they're doing to themselves is so incredibly sad. I love the picture of the soldier. That, in itself, is a tear-jerker. You're welcome, Susie. I didn't think I'd find quality photos and then I was blessed to find these. You're right - many women and teens and children hide their tears as well, but from experience, I know it's a shield- their coping mechanism. Praise God we have a wonderful role model to follow if we only get the Word out. Great post, Anita. Our strong, incredible Savior knew the importance of expressing emotions! I agree with Niki, my eyes start leaking when I see men cry. When someone gets choked up, we feel that same sensation. It's amazing.